Tagged Shortfin Mako Shark (Isurus oxyrinchus). Credit: Mark Conlin, SWFSC Large Pelagics Program [Pubilc Domain]. The genus name Isurus comes from the greek words meaning "Equal Tail"
The species name oxyrynchus comes from the greek words meaning "Sharp Nose"
The species name paucus comes from the latin word meaning "Few"
The Isurus genus first appears in the Paleocene. 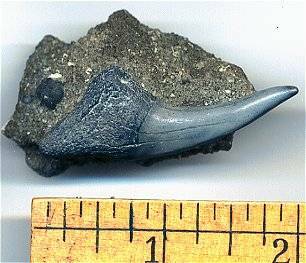 By the Miocene it branches into the modern Mako sharks and the White Sharks. The Shortfin Mako shark has a global distribution in offshore temperate and tropical waters. The Longfin Mako shark is less common and less is known about them. However, they have a nearly global distribution in offshore tropical and semitropical waters. 2.5 - 4.2 m (8 - 13 feet) Shortfin Makos are slightly smaller than Longfin makos. The largest Longfin mako accurately measured had a length of 13.7 feet. The diet of a Mako shark is almost entirely fish, smaller sharks, and sometimes squid. They have very long and thin teeth, ideal for grasping onto fish. 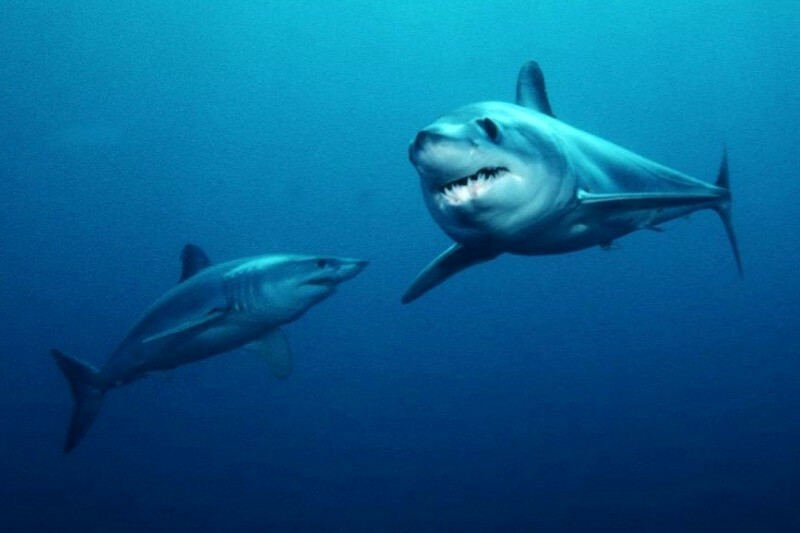 Mako sharks have a dark blue dorsal surface and a white underbelly. They are very slim and hydrodynamic. The Longfin mako looks very similar to the Shortfin mako but has larger fins and eyes. 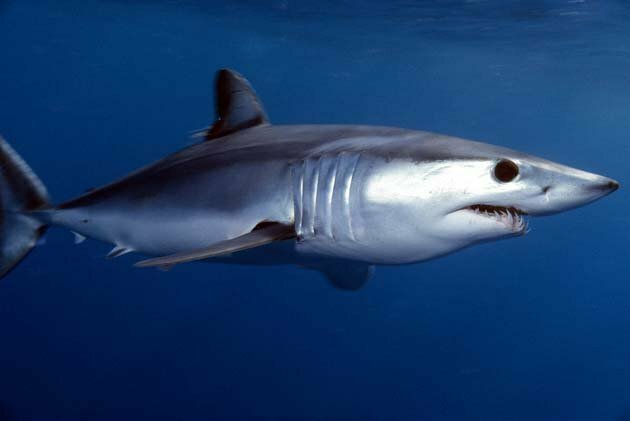 The IUCN lists Mako sharks as Vunerable. Mako sharks are the fastest of all sharks. A Shortfin mako has been reliably clocked at 31 mph (50 Km/hr), and is thought to achieve even faster bursts of speed! For comparison, an Olympic swimmer can swim at speeds around 5 mph. Shortfin Mako sharks are known to jump out of the water. They can leap to incredible heights of over 30 feet! Migratory? Based on studies of tagged individuals, Shortfin makos may migrate to warmer waters in the winter. Shortfin mako shark, Isurus oxyrinchus, off Catalina Island, California, eastern Pacific Ocean. Credit: jidanchaomian via CC BY-SA 2.0. There are two living species of mako sharks today. The Shortfin Mako (Isurus oxyrinchus) and the less common Longfin Mako (Isurus paucus). 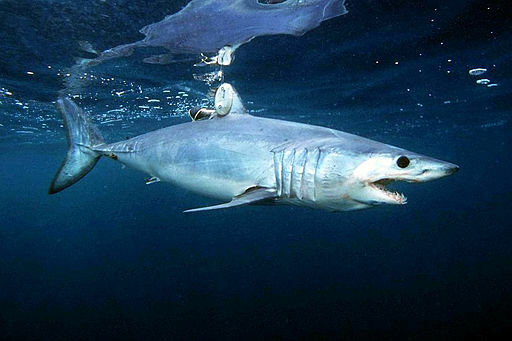 Both Makos are very similar, but the Long-fin Mako has a slimmer body and larger fins. Makos are pelagic, they prefer the open ocean, and live in tropical and temperate waters worldwide. They are also very hydrodynamic, and are among the fastest fish. Depending on the source, they can attain speeds anywhere from 20 mph to 30 mph. According to the FMNH, the average adult size is around 10 feet (3.2 m). Because of their size and speed, Makos are a popular sport fish. 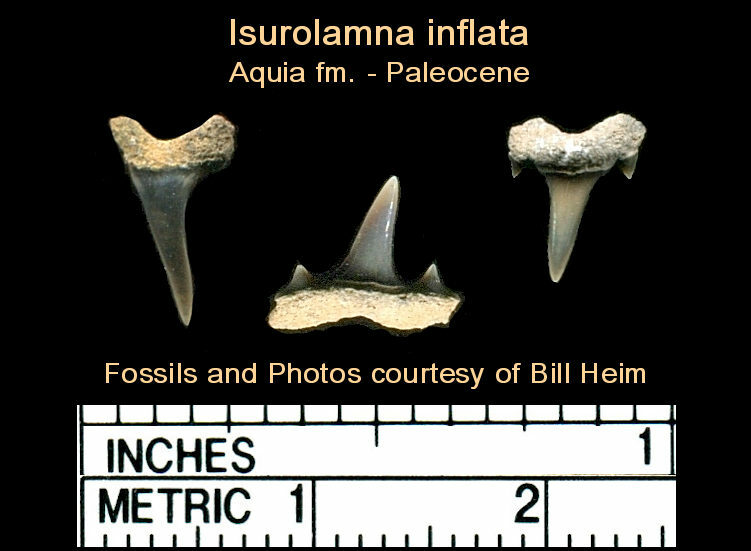 These are sample early mako shark teeth - Isurolamna inflata - from the Paleocene Aquia formation. The fossils and photos are used by permission of Bill Heim. Due to the nature of mainly isolated teeth being found and a wide range of tooth morphology in mako sharks, research on mako shark evolution appears to be convoluted and incomplete. A detailed account of Mako shark evolution is beyond the scope of this page. The section below gives a very general overview of Mako shark evolution. Mako sharks first appear in the fossil record as the genus Isurolamna in the Paleocene possibly around 60 million years ago. In the Eocene, around 55 million years ago, the Isurus praecurser (Macrorhizodus praecursor) genus branches from the makos. This "Macrorhizodus" genus continues to diversify throughout the fossil record. The teeth broaden over time and eventually branch into the White Sharks (Cosmopolitodus and Carcharodon). To learn about White Shark Evolution, head to the Prehistoric White Shark Page. What about Isurus escheri, the serrated mako? Based on an associated skeleton from Europe, the escheri species appears to be more closely related to the Cosmopolitodus and Carcharodon generas than the Isurus genera. Although more closely related to the White Sharks, it still had some differences, and was given the genus Carcharomodus (Kriwet et al, 2015). 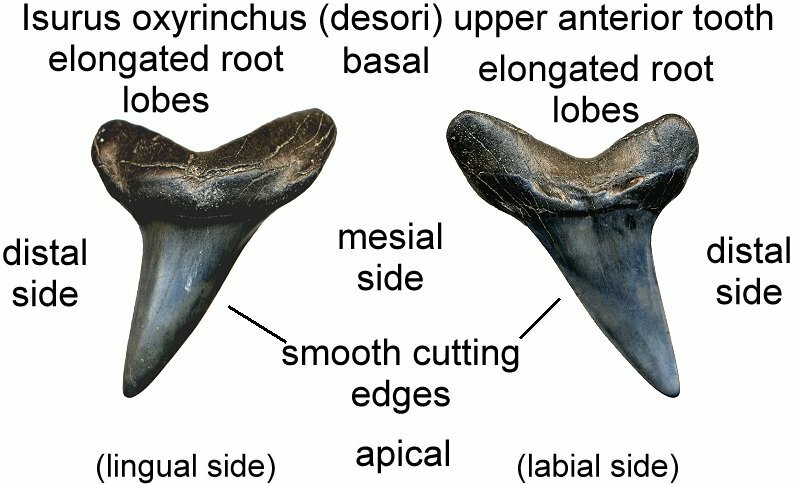 To learn about C. escheri, including images, go to the Prehistoric White Shark Page. It's important to note that research on mako evolution is far from complete. For example, some researchers consider I. retroflexus and/or I. desori to be separate species. The above is to be taken as a general overview of current research. I would like to give special thanks to Bill Heim for clarifying some aspects of Mako shark evolution and providing fossils for this article. 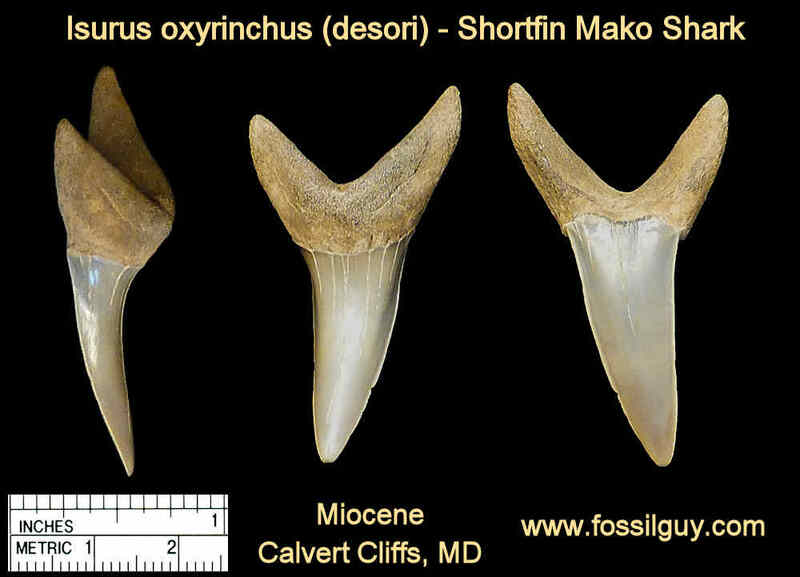 The wide, triangular teeth that are often called "makos" by amateur fossil collectors are actually extinct White Sharks. 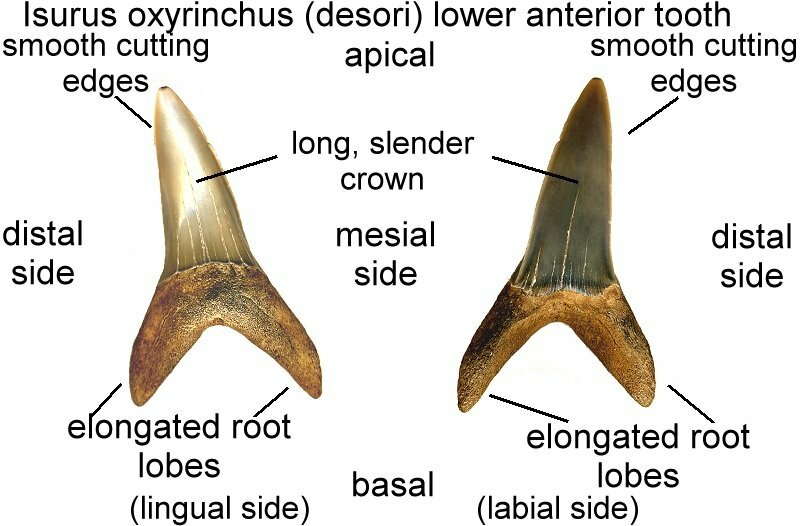 If you are looking for information and identification for those teeth, go to the Prehistoric White Shark Page. Isurus oxyrinchus, an extant Mako shark is thought by some to be the same as I. desori, an extinct mako shark. Therefore, I oxyrinchus may be synonymous with I desori. These teeth are also very similar to I. paucus, the other extant Mako shark. It is currently being debated wether or not some Isurus tooth forms are of I paucus. If I paucus is to be differentiated from I oxyrinchus in the fossil specimens, the differences are very slight, and will not be discussed here. I oxyrinchus upper teeth are have long, slender crowns. Their roots are long in the anterior section of the mouth and become more squarish as the teeth transition to laterals. Also the crowns of upper laterals tend to be broader than the upper anteriors. Lower teeth also have long, slender crowns that have a lingual bend. The crowns however remain more peg-like as the teeth transition to laterals. Below are two diagrams, one of an upper anterior tooth, and one of a lower anterior tooth. is a great book about Great White sharks. This 144 page book is geared for a general readers and students and is full of great pictures. The author is a professional photographer who has been researching Great Whites for over 20 years. Desert Sharks, by Mark Renz, takes you to the deserts of Peru in search of prehistoric sharks. This book is full of stunning images and interviews from paleontogists. It traces the the evolution of the Great White Shark, which evolved around 4-5 million years ago in what is now the deserts of Peru. This 193 page book also contains a ton of beautiful photographs, just look at the one on the cover! This is a great educational and creative introduction into the world of sharks. Kids create and paint casts of a Great White, Thresher, Hammerhead shark, and the corresponding shark teeth. They learn basic shark information as well as differences between types of sharks! Isurus oxyrinchus teeth are very similar to the fossil I. desori teeth. Many believe it should be assigned to the same species. This beauty (a lower anterior) is as big as my North Carolina mako finds! Left is the lingual view, right is the profile view. It is 2" in size and comes from the Calvert formation of Maryland. 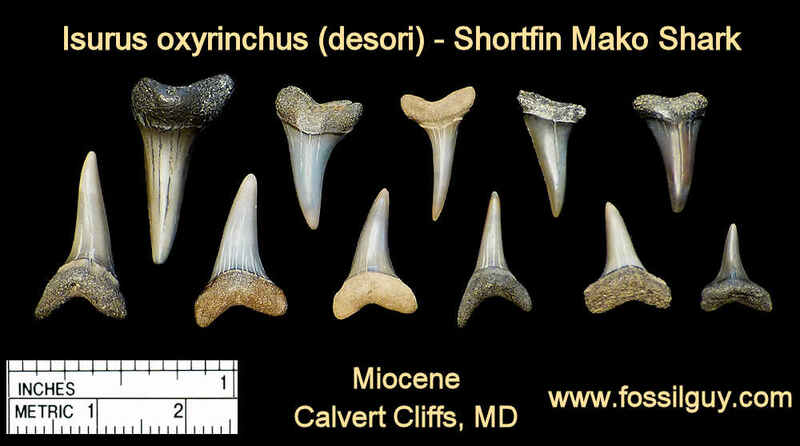 These are additional fossil mako shark teeth from the Calvert Cliffs of Maryland. This is a 2" Shortfin Mako shark tooth found at the PCS mine in Aurora. It's still in a little bit of matrix. 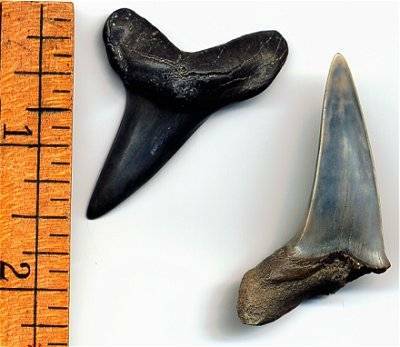 These are two other Shortfin Mako sharks tooth found at the PCS mine in Aurora. The largest is 2". They are from the Pungo River formation. This is an upper anterior tooth from North Carolina - Pungo River fm.